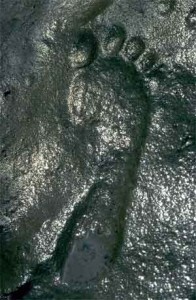 "The Zapata fossil human footprint was initially discovered by a hunter in a wilderness area of New Mexico. . . . The shallowness of the track indicates that the newly formed rock layer must have been partially set up when the human stepped into sediment that would eventually become hardened rock. The limestone that the footprint was found in was identified as Permian which is allegedly 250 million years old."